Hire a luxury SUV with professional driver and enjoy the beauty of the Wine Country! Cross the Golden Gate Bridge and admire the natural beauty of the San Francisco Bay and of Sonoma & Napa! Visit 4-5 out of 600 wineries! Taste red, white and sparkling Californian wines! Learn the history of the most famous wineries ! The tour lasts on average 8 hours. We will start our trip at Jacuzzi Winery. The Italian style winery was founded by the same family that invented the world famous bathtub & established the company that has over 250 worldwide patents for advancements in pump systems, jet technology, air control and product design. You will hear more details while tasting their wines. The Olive Press produces Jacuzzi Family Vineyards' award winning olive oil. The Olive Press Olive Oil Tasting Room and Gift Shop is dedicated to anything and everything having to do with olives and olive oil. You will find many unique and distinctive items for gift giving and for your own home. Olive oil and wine tasting here are free. Our next stop is at Domaine Carneros by Taittinger that was founded by the Taittinger family of Champagne. It produces world class award wining sparkling wines as well as Pinot Noir. The Domaine Carneros château is a California wine country landmark. It is inspired by the classic 18th century Château de la Marquetterie in Champagne, France - home of Champagne Taittinger. Starting at $30 per person. Next we will visit the Buena Vista Winery. Founded in 1857, it is the oldest commercial winery in California. The original hand-dug caves are still on site, and are open to visitors for tours after a reconstruction. The visitor center, located inside the original wine press house, provides access to the original champagne cellar. Buena Vista is listed on the National Register of Historic Places and is a California Historical Landmark. The winery produces 100,000 cases of wine including cabernet sauvignon, syrah, pinot noir, merlot, sauvignon blanc, zinfandel and chardonnay wines, as well as a host of unique historical varietals labeled under the "Vinicultural Society" label. Starting at $20 per person. Then we will head into downtown Sonoma to Sonoma Plaza. Sonoma Plaza is the perfect destination for 2 hours or 2 days! 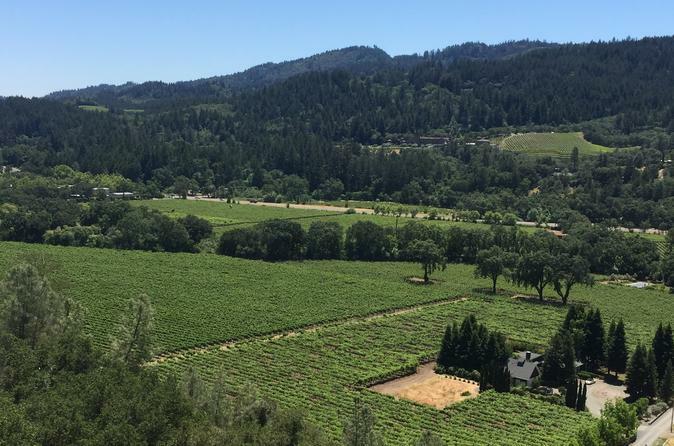 100+ shops and art galleries, 25+ wine tasting rooms, 30+ great places to eat, and many other things to experience.Take the sights, attend a cheese tasting, do some shopping, taste some wine, and visit the historic Mission in this eight acre National Park. Our next stop is Cline Cellars. This winery created legendary Zinfandels, distinctive Rhone-style wines, and Sonoma Coast Pinot Noir, Merlot and Chardonnay. While most wineries close at 5, Cline stays open till 6. It is a perfect winery to close the tour. All the listed stops are just recommendations. We will be happy to replace them with wineries chosen by our guests.